Let’s face it, after 12 weeks of running 4-5 times a week, you start to get a little bored. I’ve changed my running routes that many times that I could probably pass ‘The Knowledge’ exam section for the South East of London. I could tell you, without hesitation, all 6 TV stations that are on in my local gym between 6pm and 7pm weeknights and (because I’ve read the text on my treadmill so many times) what the average heartbeat of an 80-year-old man running at 65% would be. Let’s just say, maybe it’s time to change things up a little. Wednesday night, 45-minutes hard-effort. I plonked myself on a treadmill, ready to set off, only to turn around to see a work-colleague warming up for her spinning class. I went over. “How long is this class?”, I asked. “45 minutes”, she said. “You should join me!”. It was a sign. My blisters needed a bit of a break and after my 19-miler things were a little chafe-tastic. My buddy showed me how to adjust the seat and the instructor came around to show me the ins and outs. I knew that the seat had to be low enough so that at the moment your pedal is at the bottom of its revolution, your knee joint doesn’t lock out. But that was about it. Turns out it’s a dangerous game this spinning. The pedals are connected directly to the flywheel at the front, which means that if your feet come out then the pedals will continue spinning, entangling your legs! We set off, my colleague on the bike immediately to my left, and I was determined not to be shown up. I’ve been running well for 12 weeks now so I should be fairly competent at this! I thought it was just going to be a case of pedalling at different tempos. ‘Pedal fast, now pedal slow.’ But after a series of different positions (standing, sitting and squatting), tempos (sprint, three quarters and in-time with the music) and resistance (the dial at the front making it feel like you’re riding through treacle) I was absolutely spent. I’d managed to finish well but I’d stupidly not brought a towel with me and I was sweating so much I couldn’t see. I have a new-found respect for those that do that twice a week as it can be killer on the knees. I was obviously a beginner. My seat adjustment was slightly too high and at the sprint sections it meant that I was bobbing up and down on the seat like a jackhammer. I bruised my tail bone as a result (back to running for me). On Thursday nights I’ve changed my running for a weekly game of 5-a-side football. Our company sponsors a league, playing our clients. Our boss keeps telling us to let them win but at the moment there’s been no ‘let’ about it. 6 games and no victory so far. Again, when we started (6 weeks ago), I was adamant that my marathon training would give me an advantage over my colleagues as half of them haven’t done any exercise in a year! Again, I was wrong. Football is a completely different type of exercise to long-distance running. The constant stopping, starting, sprinting, walking, twisting and turning is killer on the joints and I initially grew tired quite quickly. Changing up the routine to include football once a week has really developed my quads and, 6 weeks after starting, I can now last the 30 minutes at a pretty quick pace. Unfortunately, being able to run fast doesn’t make you a good footballer (and I’m probably the reason why our team isn’t winning). With football, however, there is a very high risk of injury so I think during the last three weeks of training I’ll have to stop and let the ‘new blood’ come through. I had some smashing news today. The video entry I created for the Justgiving video competition came first place and won a cracking £100 sponsorship for the MS Society. Many many thanks to the Justgiving crew for voting for it and a huge thank you to everyone who viewed the video and got its hit stats up on Youtube. Also, a huge congratulations to Jenny Rice, Ulen Neale and Kaveh Fatemian who were awarded the runner up positions. I’m sure having a video to display on their Justgiving pages has increased awareness to their sponsorship efforts, as it has mine. Since posting the video 5 days ago, I’ve had a huge £257.22 in sponsorship. It works and even though the competition is over, there’s still a valid reason to get a little bit proactive and gain a little extra money for your charity. All it takes is a digital camera/mobile phone and a copy of Windows Movie Maker! Blair Witch Project, eat your heart out. The temptation of a video is too much to resist for today’s web 2.0 culture. The video, along with the use of Twitter, Facebook and blogging, has kept those long distance relatives and friends in the loop and has pulled some much needed sponsorship out of the woodwork. Some people who have sponsored me I haven’t spoken to for 10 years or more! Less than £400 to go with 5 weeks left. Unless I wanted to be racing against my girlfriend I’d have to book into an event sharpish. It wasn’t absolutely imperative that it had to be a race but the training guide I’ve been following has been really useful and until now I’d really had no reason to push too hard. I’ve been clocking up the hours and miles alright but I’d not really gone that extra mile (literally in this case as the most I’ve run so far is 12 miles). Yesterday, we arrived at a sunny Eastbourne, dropped off our bags and headed straight for the legendary Beachy Head. 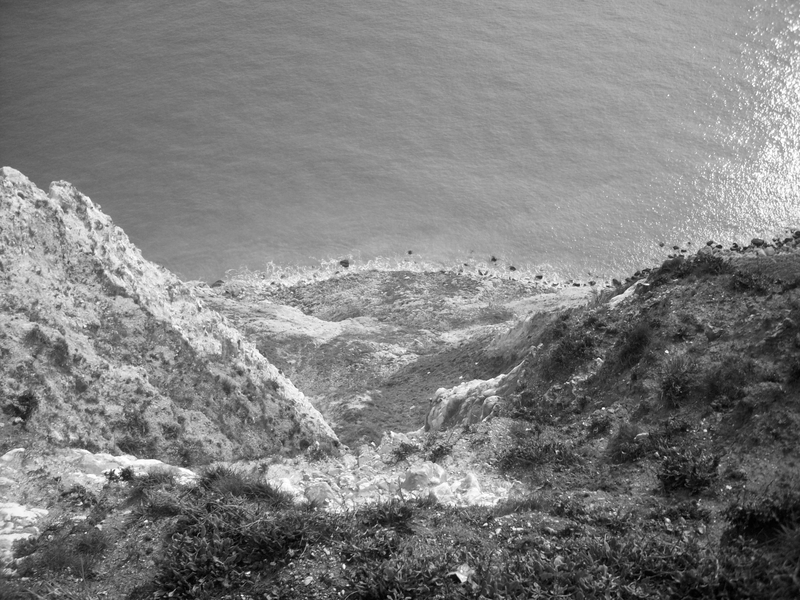 My girlfriend had foolishly told me prior to our trip that Beachy Head is a notorious suicide spot and at every opportunity I got I would walk up to the cliff edge, test the cusp with a few good stamps of my feet and peer over. This is what I saw. Gulp! After dicing with death a few more times (and one hair-raising gust of wind) I’d seen enough and we made our way back down the hill in my girlfriend’s car. However, as we came back down we noticed yellow arrow markers stapled to trees and road signs and quickly realised that this was the hill between 2 – 3 miles! To say the gradient was steep was an understatement. In our car it looked like we were in a roller-coaster (I felt like raising my hands above my head)! Now, I do occasionally exaggerate to make a story more interesting but you’ll see later on just how steep this hill was. 7am and an early rise at our beach-view hotel (courtesy of lastminute.com and a shrewd girlfriend), a quick shower and a healthy, carb-fuelled breakfast (fruit salad, bran flakes and 2 slices of brown toast). The waitress, looking at my order, said, “Are you running today? I don’t know why all these people do it, especially on a Sunday!”. Thanks for the confidence boost love, now go and get my breakfast. Back up to the room for some lashings of Bodyglide. I was wearing my MS Society vest to try it out in preparation for marathon day. A buddy of mine had told me to use the Bodyglide around the armpits where the vest would rub as he hadn’t done it on his marathon run and the chafing was unbelievable. I duly obeyed.